East Hampton, NY - September 26th, 2014 - Suffolk County Crime Stoppers and detectives from the East Hampton Village Police and East Hampton Town Police departments are seeking the public’s help to identify and locate the man who burglarized restaurants in August and September. A man entered Nichol’s Restaurant, located at 102 Montauk Highway in East Hampton, on August 31 at approximately 1 a.m. and stole a safe. 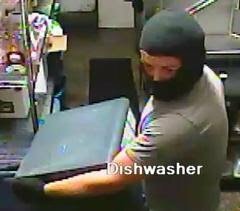 The suspect also entered La Fondita, located at 74 Montauk Highway in Amagansett, on September 1 at approximately 12:45 a.m. and stole a safe. Subject: LongIsland.com - Your Name sent you Article details of "Man Wanted for Burglarizing Two East End Restaurants"